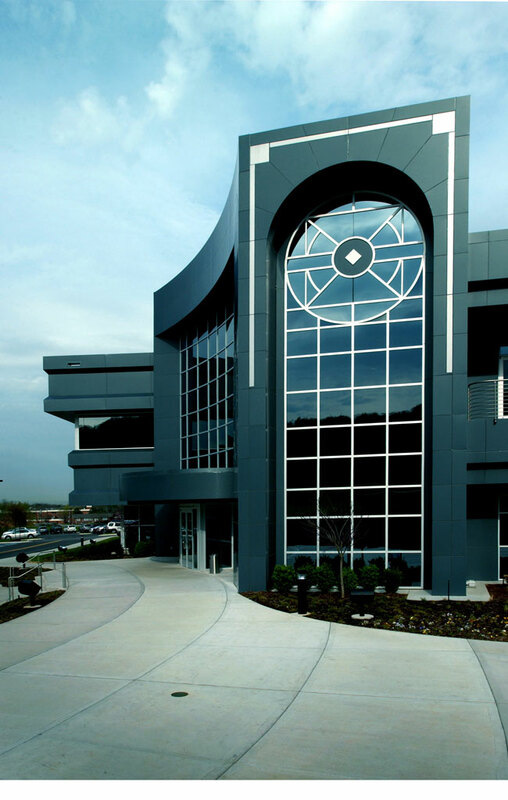 In the mid-90’s, U.S. Xpress of Chattanooga, Tennessee and SSOE, Inc., architects and engineers, spent three days developing a vision for a new U.S. Xpress headquarters building, which was completed before the end of the decade. 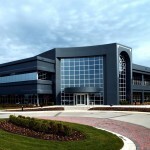 That vision allowed for expansion, now realized with the spring 2006 completion of an adjacent corporate campus and the first of four “companion” buildings. U.S. Xpress is a very creative and forward thinking organization. As such, they wanted a headquarters building that would express these attributes. “We studied the look that we wanted to achieve and many different materials. In the end, we decided that Alucobond was the best material for the job,” said David S. Verner, AIA, Vice President of SSOE, who served as project architect and manager. “The client wanted a statement about U.S. Xpress that would convey to the world in physical form the goals and aspirations of the organization,” Verner added. “That initial concept involved transformation and movement. Other touchstones included transition, flow, evolution and growth. 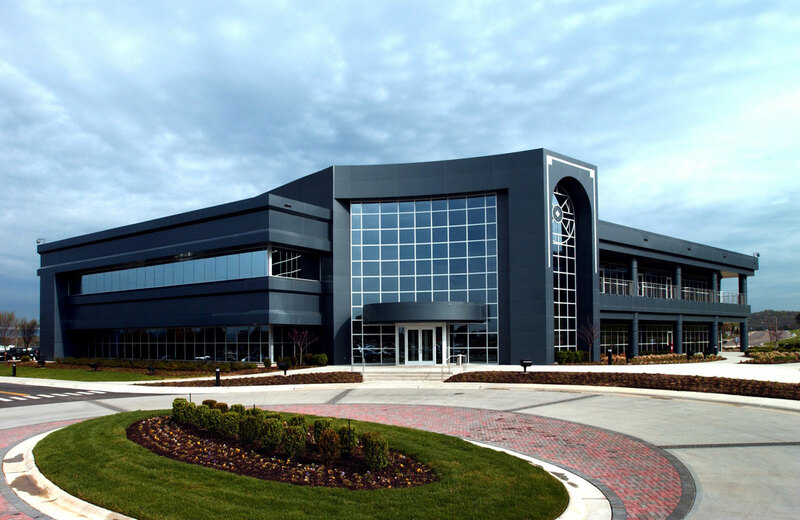 U.S. Xpress has led the evolution of trucking into a technologically sophisticated business, and these buildings include very advanced communications and accounting systems. The Alucobond Material helped to provide that ‘high-tech’ image. We took a standard color and increased the metallic flake and gloss of the color as high as possible to enhance reflectivity. This caused the building’s appearance to fluidly transform over the course of the day from soft grays to greens to blues to bright silver. 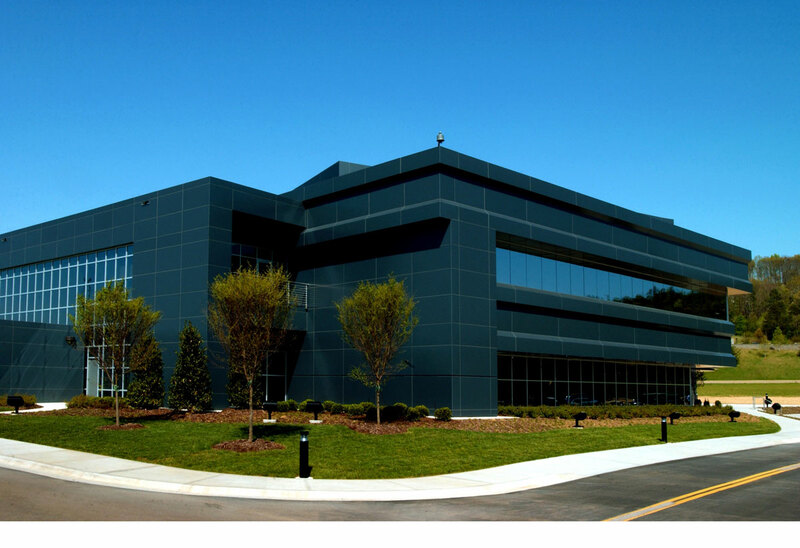 We started with a metallic slate color that became a custom charcoal gray—custom for U.S. Xpress.” The headquarters building utilized approximately 70,000 sq. ft. of 4mm Alucobond Material, attached with a rout and return wet seal method. 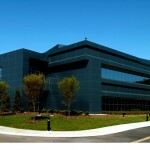 SSOE’s work included programming, concept design, construction documents, and construction administration. For the headquarters building, the Alucobond Material was part of a three-story, cantilevered triangular form, designed to maximize the potential of an L-shaped lot. A rusticated concrete base anchors the building to the site. The building was designed without a designated front or rear, and each side reveals a different look. The axis through the structure culminates at the board room balcony. Inside, a free-floating staircase 60-ft. tall is clad in Alucobond Material, with a stainless steel handrail. 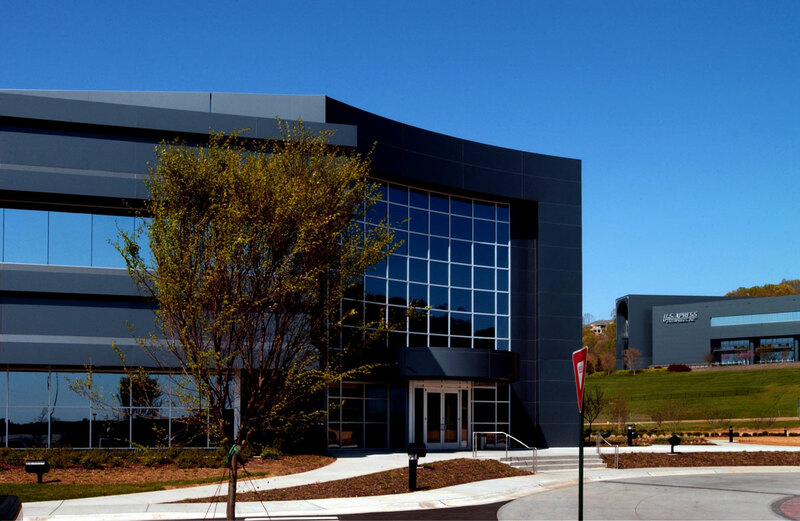 The recently-completed companion building also utilizes matching Alucobond Material in a design by SSOE that is compatible with the headquarters building. 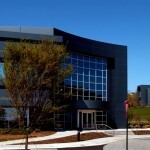 “The intent of the companion building design is to use the same architectural language as the headquarters, yet in a unique and different way. 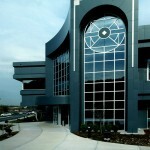 The overall corporate campus is laid out in a radial pattern around a circular center. The first two companion buildings are fan shaped and focused on the center. The buildings use simple rectangular forms to create a dynamic façade that, like the headquarters, is different at every turn,” added Verner. 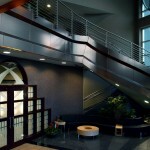 Material was fabricated and installed by the John W. McDougall Company of Nashville. For the companion building, approximately 40,000 sq. ft. of Alucobond Material in 4mm was utilized with the Series 200 rout and return caulked joint system. The general contractor was EMJ Corporation, based in Chattanooga. 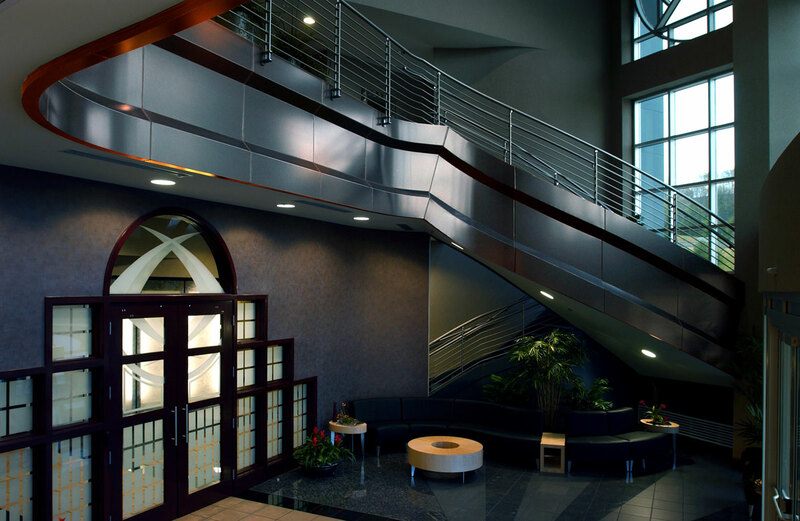 Two sheets of .02” aluminum thermobonded to a plastic core, Alucobond Material frequently is chosen for its light weight, yet its ability to remain rigid and visually flat. The material also fabricates easily for crisp corners and smooth, sweeping curves, resulting in a ‘high-tech’ appearance. The custom color was coil-coated to the material at the Benton, Kentucky plant of 3A Composites USA Inc., where Alucobond Material is domestically manufactured.